Traktor Duo: Have an aspiring DJ on your list? Get them playing, for cheap. Let’s start with some background — I’ve been a DJ, behind turntables, for nearly 17 years. In that time, I’ve seen trends, fads and the things that have stuck around. As the lowly Technics 1200 turntable is seeing the end of its days, the age-old wisdom of “learn to play vinyl first” just isn’t so fitting anymore. What, then, should a budding DJ or even music fanatic do? There are a lot of options out there, and we’ll talk about quite a few of them. But one that absolutely needs to be on your radar is the Traktor Duo system from Native Instruments. NI [Native Instruments] has been around for a long time. The company has learned some hard lessons over the years and has come out smelling like roses. In a market where DJ software runs the gamut from free to “OH MY GOD” expensive, NI has found a great niche selling quality software at a price that won’t break your bank. Traktor Duo is the entry-level offering from NI. It’s, simply, an installed software MP3 player for the Windows or OS X platform that will allow you to adjust speed, add effects, play with filters and mix music all in real time. This is the basic interface of Traktor Duo. When you first load the software, then point it to a directory where you store your music, this is what you’ll see. Of course, you can choose to show or hide nearly any section of this screen, and resize it to your liking. But for this purpose, we’ll just have you look at what it is out of the box. Up top, you see two “decks”, left and right. Each one plays a track. Within each deck, you have options to match their tempo, add cue (starting) points, adjust the mapping (where the beats show up, in a track) and more. So, load up a track in the left side and, as long as y0u’ve spent a few seconds mapping out your tracks correctly, you can choose to Sync the right side and the tracks will play with the beats matching each other. Organization of your tracks, in the bottom pane, is really simple. You can choose any number of features by which you want to sort, add and remove data at any time and add or remove any number of display options. The left side serves somewhat like a collection of crates, by which you can organize playlists, explore your files and check history. Traktor Duo handles a wealth of formats: MP3, WAV, AIFF, Audio-CD, FLAC, Ogg Vorbis, non-DRM WMA (when running in Windows) and non-DRM AAC. That means that pretty much anything in your existing collection is now able to be played, manipulated and tweaked to your ear’s content. What’s it feel like? Honestly, it feels a lot like what you’d be doing if you were playing records, just without the records. Though almost everything is controlled by mouse or button push, the premise is still the same. You load a track, wait for the appropriate time to start it, then let it roll while tweaking the sound with the effects. Traktor Duo is fluid, snappy and solid. The software has never once felt like it was on the edge of a crash and I’ve never had issues with latency even on older, lower-powered computers. Now, is this the best way to learn how to DJ? Not really. 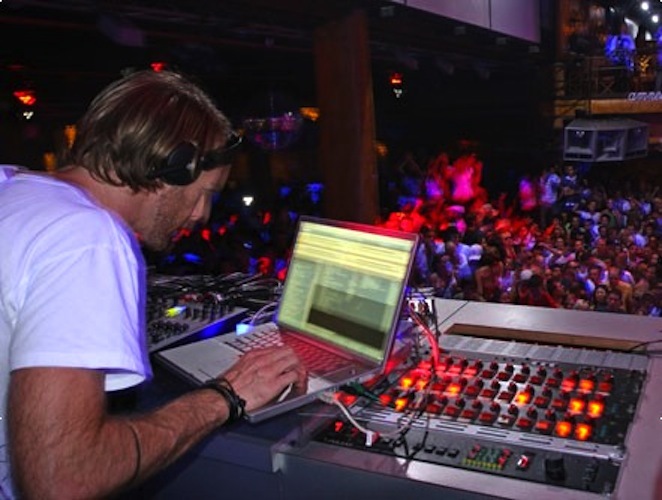 Ideally speaking, every DJ would be able to mix tracks by their ears only, without visual cues. But, as I said before, that era is closing quickly. So, if you’ve got a visual learner on your hands, Traktor Duo is an inexpensive way to get them playing, while learning the ins and outs of what makes a mix sound good or bad. Here’s the catch — with just the software, you’ll not be able to fully use an external mixer. Fortunately, there’s an inexpensive solution to this in Traktor’s Audio 2 DJ sound card. It’s an external, USB-powered device that offers 2 sets of outputs so you can hook up a 2-channel mixer. The sound quality is, frankly, astounding given its price point of $119. Want an even better deal? Traktor Duo normally runs $119 as well. Right now, there’s a 50-percent discount happening, so you can pick up the Audio 2 DJ plus Traktor Duo for less than $200 combined. If you’re asking my opinion, that’s a pretty solid setup for the beginner DJ, for way less money than you’d ever have been able to pay in the past. Kudos to NI for the half-off deal, and for seeing the way that DJ’ing is changing. Have more in-depth questions? I’ve been a Traktor Scratch Pro user for almost 2 years. Fire away and I’ll answer anything I can.